Our Head of Optimization at Optimizely has told us, time and time again, that experiments that test changes in copy are often the highest ROI. This is because copy changes require little to no technical support to set up (provided you use a tool with a visual editor), and the impact can be astronomical. That being said, getting copy just right is tough. 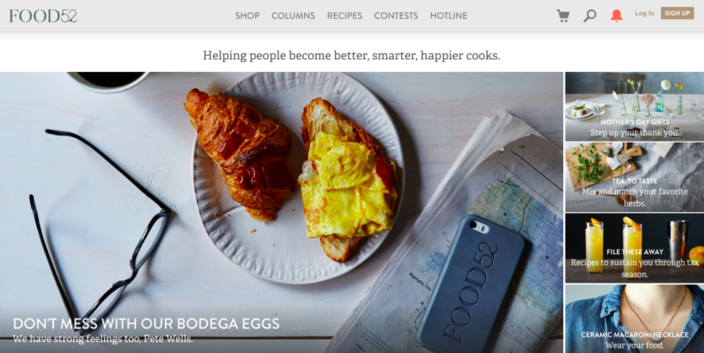 When was the last time you sat down and thought long and hard about the headline parading across your homepage? Conversion copywriting, a tactic that is becoming increasingly popular in the optimization industry, is an essential skill for any growth marketer to develop. We tuned in to a CRODay Hangout with experts Paul Jarvis, Joel Klettke, and Sean Smith, who shared their perspectives on what makes great web copy. Great copy must do a number of things the moment a visitor arrives at a website: engage them, communicate a unique selling proposition that is relevant to them, and, most importantly, engender trust so that the visitor will take the next step and convert. 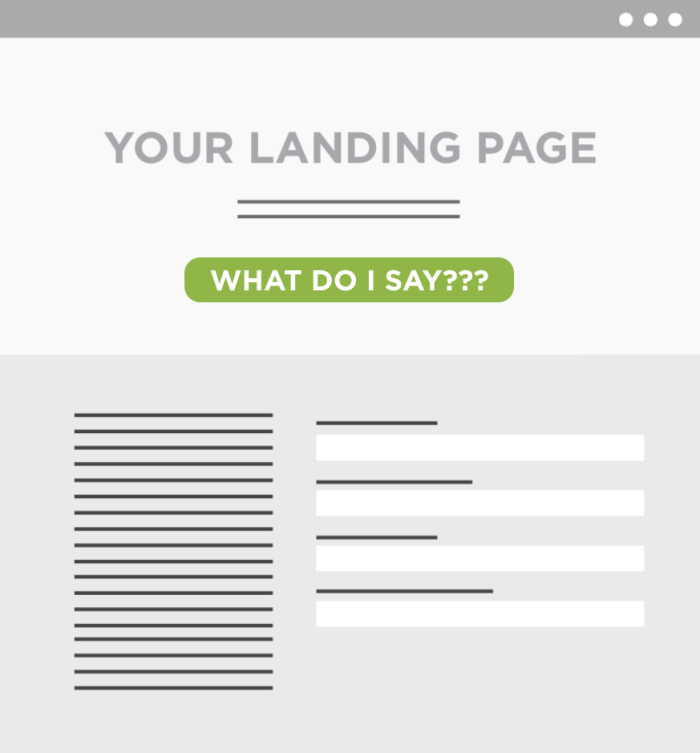 In this post, we’ll cover how to craft a clear headline for your website or landing page, tactics for deciding on the words themselves, proving they’re doing their intended job, and how the process of “logical leaps” should define what copy goes on a page. What is a Unique Selling Proposition and Why Do I Need One? A frequent mistake that companies make in their copy is failing to define their unique value to their visitors. Make specific claims - Generic claims like “high-quality” or “going above and beyond for our customers” don’t make a selling proposition unique. Focus on differentiators. Make a promise - A commitment to your customer that you’re actually able to follow through on, and that competitors cannot also offer. Are actually unique – Is having a low-cost product or service something that makes you stand out in your market? Ease of use? Time to get started or implement? Fantastic support? Are valuable – What is the value of the benefit you’re promising your visitors? Is it worth the time, money, or personal information required to gain access? Are believeable - Is what you’re selling too good to be true? Remember, the goal of your copy is to engender trust. Your audience won’t trust you if the USP isn’t plausible. We provide __[product or service]__ to __[target audience]__ so they can do __[product or service]__ without __[pain point or friction point]__. Filling out this statement forces creating a USP that deliberately calls out the audience, promise, and value of your company’s offering. Does this headline make a specific claim? Does it make a promise to me, the potential buyer/user? Is it valuable—e.g., something I would pay for? Do I believe what’s being said? 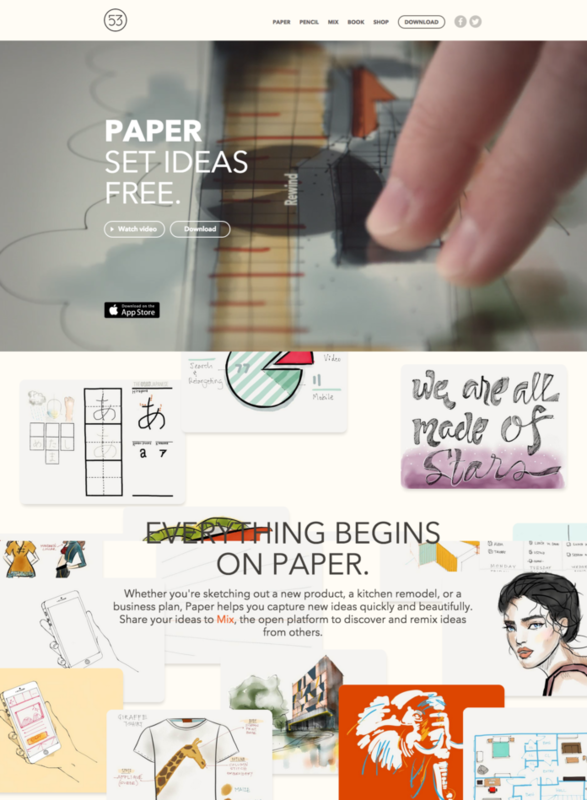 Paper by Fiftythree is an app that enables users to sketch, paint, annotate, share, and bring ideas to life via an iPad app. However, Joel Klettke pointed out that new visitors to their homepage might have a hard time converting to download the app based on the USP they see. “Set ideas free” is the leading headline, followed by “Everything begins on paper”. Although these ideas are very creative and aspirational, they lack specificity, differentiation, and a clear value for the audience. 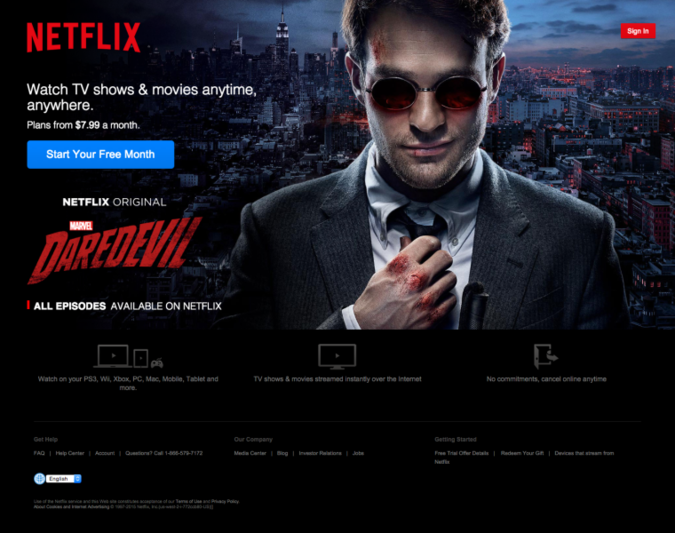 By contrast, Netflix’s homepage is supported by the clear promise of: “Watch TV shows & movies anytime, anywhere.” Below the fold, supporting copy describes exactly how Netflix delivers on its “anytime, anywhere” commitment and promotes the value of its service with confidence, stating that users can cancel at any time with no repercussions. According to Sean Smith, a clear USP—and great conversion copy, generally—places a focus on benefits over features. This means that instead of highlighting what the product or service does, the copy should emphasize what the customer can do with the product or service. Although this USP could be more specific, the takeaway for the visitor is: “Me plus Food52 equals better cooking … OK, I’m interested. Tell me more.” The rest of the homepage showcases some of these features with a beautiful editorial-style layout and descriptive nav. An essential step to creating copy that will help improve your website’s conversion rate is to validate your ideas with your users. Make sure you’re speaking your customers’ language. Far too often, the language that a company or expert uses to describe a product or service is completely different from the language that the audience uses to describe it. It is far more powerful to create a USP with the words your users use to describe your product, instead of what you and your coworkers believe are the benefits of your product or service. Try putting your company-generated language to the test against the language of your customers in an experiment. According to Paul, in his experience, the language of the customer always wins. Where do you Find this Sure-to-Win Copy? Work with the people or team(s) closest to your customers to collect their feedback—or set up a survey or chat service to solicit it yourself. Try a service like SurveyMonkey, Olark, Qualaroo, UserTesting, or Delighted to bring the voice of the customer into your brainstorming process. If a new tool is out of scope for your optimization program, a Google Form or Skype call can do the trick as well. Why did you buy/hire us? What were the problems you were looking to solve when you bought/hired? What were the results you expected when you purchased? These questions are a blunt instrument for uncovering your key differentiators and customers’ pain points—all in the customers’ language. Collect a reasonable sample and look for trends of word choices, emotions, and descriptions in your customers’ answers. The goal of any web page that showcases your product or service is to build familiarity and trust with your visitors to help increase the rate at which they convert. Sean, Paul, and Joel pointed out an important concept of “logical leaps” when optimizing copy for conversions. The concept of logical leaps is: what appears to be a logical sequence of actions on your webpage to you may seem illogical to your visitors. If you design and write your page based on what makes sense to you, your visitors could read the content and still be confused about what you’re offering, uncertain of what the benefit of taking the next step would be, or unconvinced that you are the best solution to their problem. This is why using the language of your customers is a key component of conversion copywriting—by using familiar language, visitors feel that you understand them. 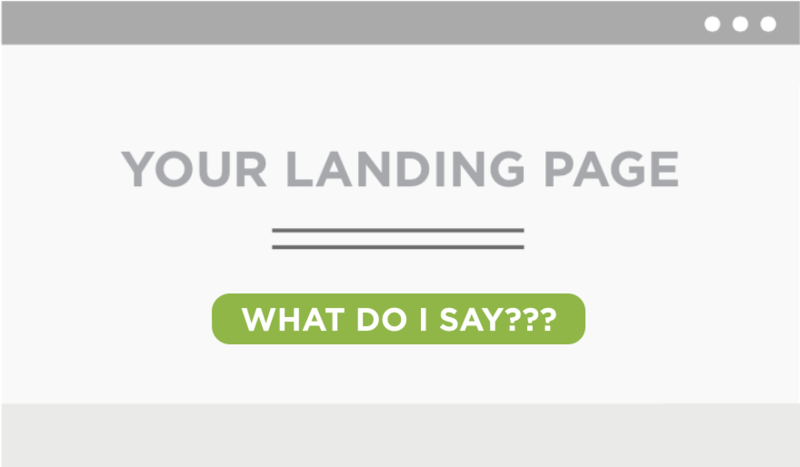 There are also a number of other elements that will help build trust on a landing page. One example is social proof, a strategy that incorporates direct quotes and testimonials from current customers into a web page for potential customers. 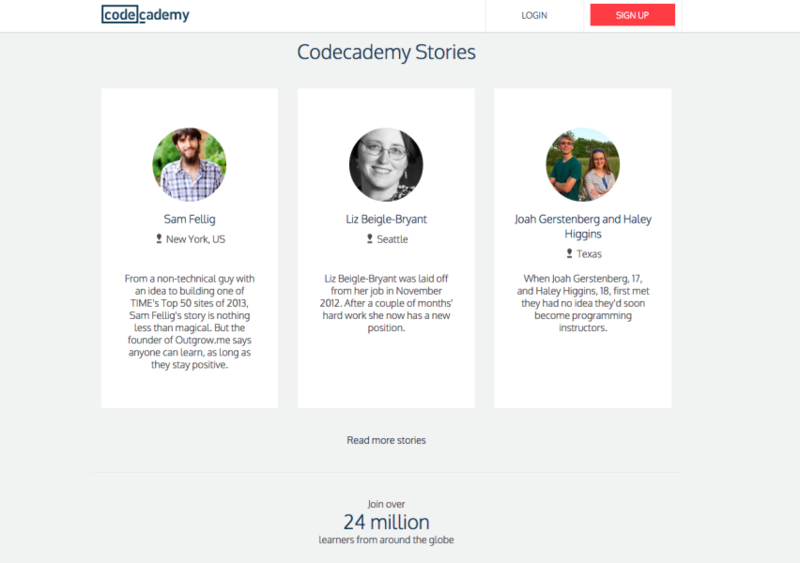 Codeacademy is an online learning program that teaches people how to program. Although the benefits of learning a skill like coding may seem self-evident, Codeacademy understands that committing time to signing up for a service like theirs requires some persuasion. They provide due attention to the success stories of their customers, building social proof into the landing page below their USP, while making their “Signup” CTA perpetually visible in the sticky navigation bar. Crafting copy that incorporates humor or elicits another type of emotion can be very effective at driving conversions. An in-depth understanding of your audience will inform which type of emotion (happiness, sadness, fear, surprise) will be most appropriate for your brand while also helping to connect with and convert your visitors. Visitors can make decisions from both an emotional and logical point of view. Test copy that appeals to either to determine the optimal message for your visitors. Using the language of your customers will help build familiarity and that all-important trust between your business and your visitor. Test out adding customer language to your unique selling proposition and social proof on your web pages, while paying due attention to the logical leaps that your visitors will need to take to convert. What do you think? Have you ever seen web copy that made you want to convert, or that resonated with you on an emotional level? Share your thoughts with us in the comments below.